Do you have a burning desire to make it to the top of the sport of motocross and supercross in Australia before stepping up to the world stage? Suzuki's 2010 RM85 and RM85L junior motocrossers have landed in Australia, sporting dynamic new graphics to match their race-winning potential. Suzuki's 2009 model of the RM85 has arrived in Australia with bold new graphics and is available now from local Suzuki dealers. 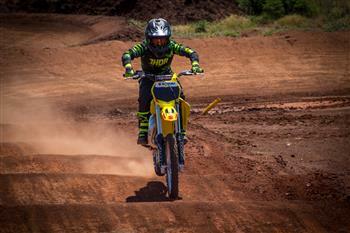 Suzuki Australia has announced the arrival of its latest junior motocrossers, the ever-popular RM85 and RM85L. Suzuki Australia has announced the imminent arrival of its 2008 RM85 and RM85L junior motocrossers, offering a sneak preview of the ever-popular beginners’ machines. 2007 RM Series Motocrossers Are Here! Suzuki Australia has proudly announced the arrival of its full range of 2007 RM-series motocross machines. Suzuki Australia has released advance details of its latest junior motocross machines, the RM85 and RM85L Big Wheel. Still available in two wheel-size versions, RM85 and RM85L (Bigwheel), Suzuki’s mini-class machine features a high-revving, single-cylinder, two-stroke engine that produces strong peak power and torque. Still available in two wheel-size versions, RM85 and RM85L (Bigwheel), Suzuki’s machine of choice in the mini-class features a high-revving, single-cylinder, two-stroke engine that produces strong peak power and torque. Suzuki has released the much awaited, more powerful RM85 mini motocrosser throughout Australia. Suzuki's bonus Race Kit supplied free of charge with every Suzuki RM85 has been given a fresh new look ahead of the 2017 junior motocross season.